My recent visit to my great grandparents' San Francisco homes inspired me to contact my second cousin from that line and ask him to donate some DNA to my series on second cousin studies. To my great pleasure, he readily agreed with no persuasion necessary. Happily, this is a case of someone who isn't the slightest bit concerned about the implications of DNA testing. I just received an email that his sample was received by 23andMe. This is very exciting because it means that I will now have tested second cousins from all of my ancestral lines and I will be able to identify DNA from each of my four great-grandparent couples in myself and my immediate family. To me that is very meaningful. Those of us who study genealogy have spent countless hours searching for tidbits about our ancestors, attempting to know them better. It is gratifying to not only know they are a part of us, but to be able to specifically see evidence of this inside ourselves. 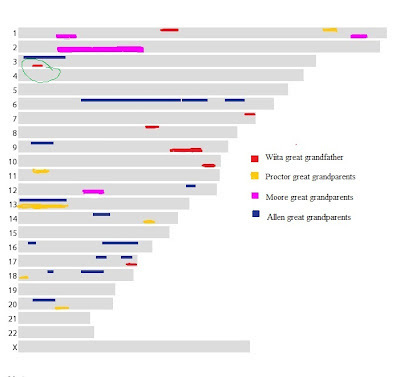 For example, in Part One of my series on second cousins, I found DNA from great-grandfather Matti Wiita Reini (specific to one great-grandparents since it was a 2nd cousin once removed relationship). Part Two revealed DNA from Daniel and Millie (Travis) Proctor and Part Three showed DNA from Willard and Blanche (Purdy) Moore. Part Four, yet to be written, will reveal DNA from George and Fredrikka (Herstad) Allen. 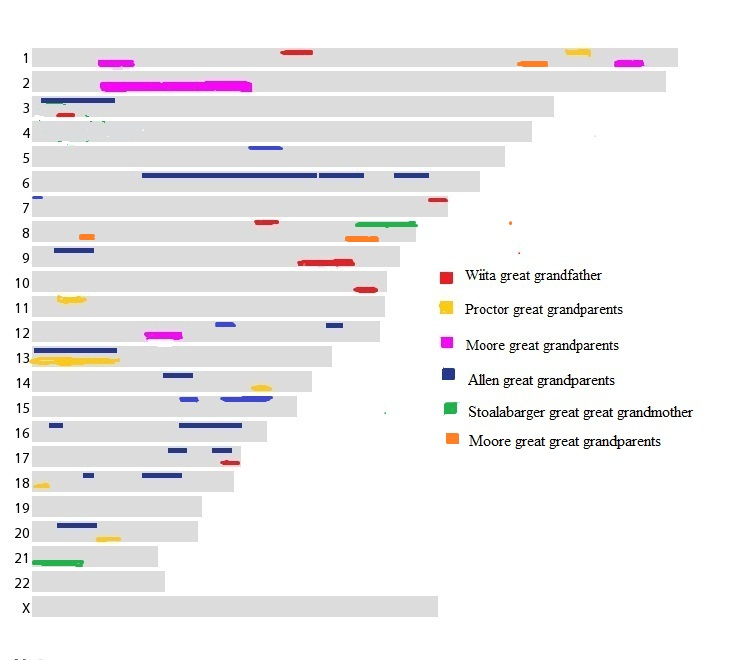 My plan is to map the DNA from each of these ancestors to the specific spots on my chromosomes that match each of my second cousins. This then tells me specifically which parts of my DNA come from which great-grandparents. In doing so, I hope to answer the question that I was asked last week at my presentation on autosomal DNA testing for genealogy, "So what does all this DNA matching really mean?" and to inspire more genealogists to explore DNA testing for genealogical purposes by demonstrating to them just how meaningful it can be. This is such a great project! I wish I had unlimited funds so I could convince relatives to be tested at no cost to them. It is a long-term project for sure, Kathy. I have been fortunate that some of mine have tested themselves. What format are you using for mapping DNA segments? I would like to try to do this too, but haven't yet figured out the best way to proceed. I am decidedly non-techie, so I am doing it by cut and paste and by hand. I am sure someone will come up with an efficient program to do it, but I want mine to look something like my update above. 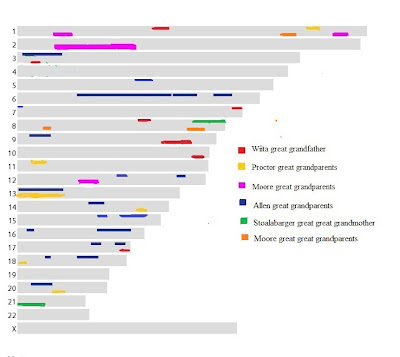 I love your updated chromosome map. I wish someone would come up with an efficient program to do it. Since I last posted, two brothers and a second cousin have added their results. It would be so nice to be able to compare multiple relatives on one map like you did. Kathy, keep your eyes on this space. When Kitty Cooper's program is finished, I will post info on where to find it. Andrea Badger made a spreadsheet with graphs. The segment data can come from Family Inheritance advanced of 23andMe. Yes, I have tried Andrea's template, but would prefer to have both the paternal and maternal chromosomes on one graph. Kitty Cooper is currently working on a program to do that. 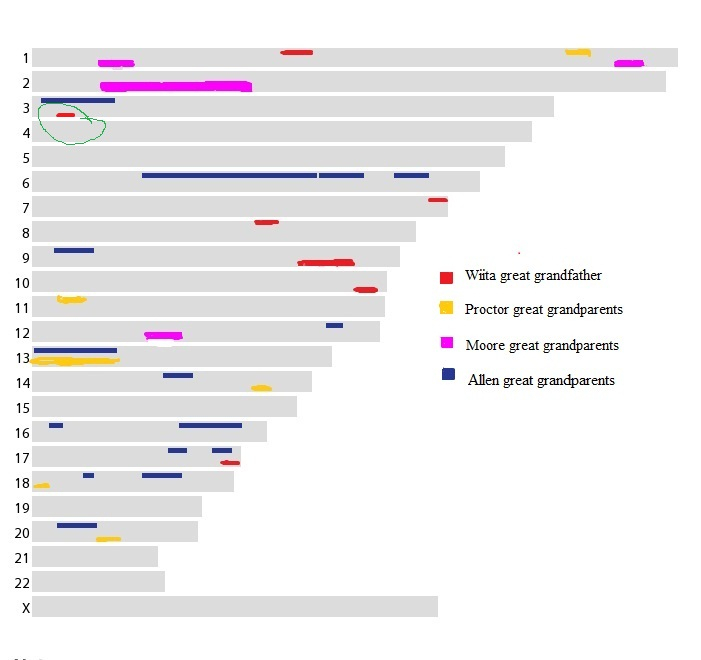 You might want to put your Allen and Moore (blue and pink) on the same line of the chromosome as they would be on the same chromosome (in this case your paternal chromosome). See chromosome 12. I wish my 2nd cousins would be so willing- I'm trying to figure out a part of my chromosome map and when I contacted them to ask them to please do their DNA test- and I would pay- they said, "I don't do DNA anything!" ooookkkkaaayyy!! sigh. FTDNA 36-Hour Facebook Sale Today!